IHRA Australia is excited about adding a new category into the Professional Class of Pro Alcohol. The class will be known as: Pro Alcohol Injected Nitro Dragster. The bracket designation: PA/IND (Pro Alcohol / Injected Nitro Dragster). IHRA Australia would like to announce the implementation of a new Performance Sportsman Record Review Committee. This committee will cover all areas of the IHRA Australia Performance and Sportsman categories. IHRA Australia looks forward to working with this Record Review Committee in achieving the best possible outcome for the sport. Designed for naturally aspirated, hig reving applications. QM25 is an oxygenated unleaded racing fuel like no other! 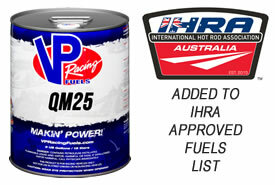 Compared to other Unleaded racing fuels, QM25 has shown to have significant torque and HP gains. Suited for Australian Pro Stock, Super Stock and N/A drag racing applications. Just a reminder that these fake harnesses for sale on eBay and other on-line stores have been sited at Willowbank Raceway recently. HRA Australia is pleased to announce the implementation of a new review panel being commissioned by IHRA Australia and Pro Slammer, this new initiative has seen the appointment of a dedicated group of individuals covering all areas of the Drag Racing Industry. Maurice Allen IHRA Australia CEO sees this review panel as a great step forward for Pro Slammer that will see the Panel meet three times per year to discuss and implement policies overseeing areas such as protective clothing, minimum race car specifications (including SFI), areas of safety equipment, Which will all help to ultimately deliver a standard spec vehicle for Australian ¼ Mile Pro Slammer racing for both current and new cars entering Pro Slammer. IHRA Australia looks forward to working with this review panel in achieving the best possible outcome for the sport. Due to the team failing to fulfil a request to supply technical data, the decision by IHRA Australia has been made to withdraw race car no: 125 from the final results. The event results will stand with no winner declared. The sanctioning body for Sydney Dragway, IHRA Australia, has conducted a series of investigations following the incident involving Sam Fenech’s Pro Slammer at the Santo’s Summer Thunder event last Saturday. IHRA Australia are saddened to hear of the sudden passing of Des Curnow owner of the retired Blackjack Racing Team. We would like to pass on our deepest condolences to his wife Helen and sons Brett and Darren and to Des's family. Ever wanted to work in motorsport? Now is your opportunity. IHRA Australia is now recruiting stewards for Sydney Dragway NSW. Sydney Dragway and Atlantic Oils are pleased to announce that from 2019, Atlantic Oils will become the naming rights partner of the East Coast Thunder to be held in November at the iconic Sydney Dragway. Exciting news IHRA Australia is preparing to roll out Junior Drag Bike (JDB) in Australia. IHRA Australia has been working behind the scenes to put a program together, which will allow JDB Racing to be introduced. Reciprocal Event Licences are available for all Professional and Sportsman racers with an alternative sanctioning body, who wish to compete in a IHRA Australia Sanctioned Event. Request and payment for a Reciprocal Event Licence must be completed prior to the Event. In an Australian drag racing first, IHRA Australia / 400 Thunder are now going to reward the Top 5 point’s scorers after the 51st Gulf Western Winternationals, with the prestige of running a single digit number for the following season. A historic night of racing concluded with a the first ever all-female Top Fuel Final Round at the Gulf Western Oil Nitro Thunder at Sydney Dragway, in front of a massive crowd on Saturday night. 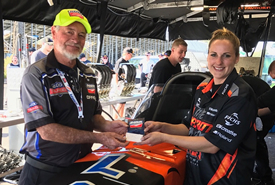 Californian speedster Ashley Sanford will re-join her Rapisarda Autosport International team mates Wayne Newby and Damien Harris for the Gulf Western Oil Nitro Thunder meeting at Sydney Dragway on May 4-5. IHRA Australia have been issuing licences in Australia for the last 3 years, and have reserved race numbers up to 6000 to accommodate racers transitioning to IHRA Australia and having their current race number reserved. As of 1st July 2018 this transition period will cease. All race numbers left vacant will be available for re-issue. Head office will do its best to full fill all requests where possible. Please Note: A fee for two,three and four digit numbers will apply. IHRA Australia are please to advise all South Australian racers that we have appointed experience Technical Inspector Michael De Rose. With the remaining two major 400 Thunder Events it helps SA racers prepare for these two upcoming events. Michael's details have been updated on this website. IHRA Australia would like to introduce Melanie Wyatt to the Role of Office Administration. Melanie has a previous background in the Hot Rod Industry and has also been involved in Dirt Drag racing as well. Melanie also enjoys spending time with her horses on the weekend, a little bit more subtle Horse Power Somewhat explains Melanie. Who has also attended may previous Drag Racing events over the years. We look forward to Melanie taking on this role and no doubt all of the racers will come to know her as the voice over the phone at Head Office. Notice of Recall: Driver Restraint Assemblies Manufactured and Certified to SFI Specification 16.1 by Ruian Dragon and Ruian Dongjinlong. Both Top Fuel Kelly and Pro Alcohol Championship points tables closed right up after an exciting night of 400 Thunder Drag Racing at Willowbank Raceway on Good Friday. Rookie Top Fuel driver Kelly Bettes took a stunning upset maiden win at round 3 of the 400 Thunder Tip Fuel Championship at the Santo's Summer Thunder in Sydney last night. Tragic news out of Mackay Queensland with the news that George and Frank Vella have passed away in a workplace incident. George was a terrific person who competed in Pro Stock Motorcycle and was only competing a few weeks ago at Willowbank Raceway. The Drag racing community would like to extend its sincere condolences to George's family friends in these terrible events. Fast-growing sanctioning body announces new Technical and Administration roles. Record growth set to continue with vision of viable future for Australian Drag Racing. After the loss of the 400 Thunder Australian Professional Drag Racing Series championship round due to be run at Calder Park in January, Sydney Dragway will now host round 4 of the 2017-18 Pro Slammer Championship at the Santo’s Summer Thunder in January 2018. Ever wanted to work in motorsport? Now is your opportunity. IHRA Australia is now recruiting stewards for Willowbank Raceway. Larry Ormsby releases limited edition book " The Larry Ormsby Scrapbook"
Top Fuel Drag Racing to compete over 1000ft. IHRA as a recognised leader in safety standards has been working to improve safety standards within Australia.